Ready to drink. Consume soon after opening. Ingredients: Sake (Glucose, Water, Preservative (E224) (Sulphites)) (60%), Water, Sugar, Sakura Extract (2.155%), Acidity Regulator (E330), Preservative (E211), Colour (E129). 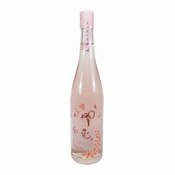 Simply enter your details below and we will send you an e-mail when “Sakura Sake Rice Wine (7%) (美粒之果園櫻花酒)” is back in stock!